iGaming2go is a company that provides software for various online casinos and specialises in providing software for mobile casinos. This company, which was established in 2007, is currently based in Bratislava in Slovakia. The aim of the company is to continuously provide both online casinos and players with a range of excellent games. At the minute iGaming2go focuses on producing video slots. As such, when creating their games, iGaming2go ensures that both the sounds and graphics are of the highest quality possible. All games developed by iGaming2go are fully compatible with all the latest smartphones and tablets and are produced using HTML5, which allows for easy integration with existing operating systems, such as iOS and Android. In order to access the company’s games, you don’t have to provide them with new username or password, nor do you have to allow them to access your personal information or bank details. iGaming2go’s video slots have been designed to offer a memorable and thoroughly enjoyable gaming experience. The company’s video slots come in lots of different varieties and themes, so there’s plenty to keep you entertained for hours on end. Some of the games produced by iGaming2go include Anubis, Treasures of Montezuma and Firestarter. Numerous different online casinos have been granted permission to use iGaming2go games; some of these include Long Harbour Casino, Fruity Casa and Reel Island Casino. All of the company’s games can be played in demo mode, which gives potential customers and players the chance to try the games out for free without risking any of their own money. iGaming2go is focused on the mobile sector of the gaming industry, a sector which is very quickly growing in popularity. This company uses HTML5 to ensure its games can be accessed from the latest handheld devices. Hugely popular slots and casino site, powered by a number of the best software providers including NetEnt, CryptoLogic, Microgaming and NextGen. Register for Up to £400 in Welcome Bonus Offers + 100 Spins. Double your first deposit up to £200, try out the games for free before making a deposit. Latest Microgaming slot games. T&C's: 50x wagering the bonus amount before withdraw. Valid for 30 days from receipt. Subject to site full bonus policy. 100% UP TO£200*18+ Only.New Players Only.BeGambleAware. 18+ Only.New Players Only.BeGambleAware. Euromoon offers a vast number of games from Amaya, Betsoft, NetEnt and Thunderkick. Exclusive: 200% welcome bonus up to £1000. T&C's: 1. The Welcome Bonus is a 200% Match up to €1,000 based on a New Player’s first approved Deposit at the casino. Example: Deposit €200 and receive a €400 Welcome Bonus – total account balance will be €600. 2. The maximum Welcome Bonus is €1,000 and only one 1st Deposit Bonus is permitted per New Player. 3. The Bonus+Deposit is subject to 33 times play through (Wagering requirements) before any withdrawal can be made. 200% UP TO£1000*T&C's Apply.18+ Only.New Players Only.BeGambleAware. New online casino for 2017, Midaur Casino offers players over 500+ Slots and Casino games from software giants, Leander, NextGen, Elk, Aristocrat, Bally and many more. Top slot titles, playable on desktop and mobile devices. 150% UP TO£50*T&C's Apply.18+ Only.New Players Only.BeGambleAware. Retro style online casino featuring top casino games and a fantastic amount of slots from leading software providers, Microgaming, NYX, NetEnt, WMS, Play N Go and Quickspin. .
T&C's: New Players Only. Wagering occurs from real balance first. 50x wagering the bonus or any winnings generated from free spins, contribution may vary per game. The wagering requirement is calculated on bonus bets only. Bonus is valid for 30 Days/ free spins valid for 7 days from issue. Max conversion: 5 times the bonus amount or from free spins: $/£/€ 20 or 200 kr. Full Terms Apply. Register for Deposit £10 get 20 Free Spins on Starburst/ Aloha Slots/ Finn & the Swirly Spin. Deposit £20 get 50 Free Spins on Starburst/ Aloha Slots/ Finn & the Swirly Spin. Deposit £50+ get 20% Cashback on losses for the next 2 days. 18+, T&C's Apply, Please Gamble Responsibly. T&C's: New customers only. First deposit only. 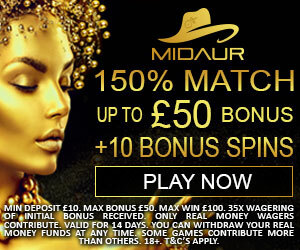 Min deposit £10, Max 50 Bonus Spins on Selected Slots only. 2x conversion. 20x Wagering. 20% Cashback on losses up to £200 for 48 hours from first deposit, T's & C's apply. 200% UP TO£100*T&C's Apply.18+ Only.New Players Only.BeGambleAware. Brand new for 2017, Ace Lucky Casino has an impressive list of software providers including NetEnt, Microgaming, Nextgen, ELK, and Thunderkick to name just a few. Huge selection of games - slots, table and card games, poker, blackjack, roulette, as well as live casino. Plenty of payment and withdrawal options and live chat available too. Progress Play powered casino with games from Microgaming, NetEnt and NextGen. Good selection of more than 250+ slots, live dealer casino and other casino games. Progress Play casino for mobile and desktop. Software used includes Microgaming, Thunderkick and NYX. Fruity King features great slots and games and classics like blackjack and roulette. Pay by phone bill available. T&C's: New players only. Wagering occurs from real balance first. 50x wagering the bonus or any winnings generated from free spins, contribution may vary per game. Available on selected games only. The wagering requirement is calculated on bonus bets only. Bonus is valid for 30 Days/ free spins valid for 7 days from issue. Max conversion: 5 times the bonus amount or from free spins: $/£/€ 20. Full Terms Apply.